I've reduced the size so hopefully this will work. Saw that on eBay looks tidy, 828 reg is cool! Thanks for the replies. I hadnt spotted the 828 connection! Lukas you have the one in the best colour I think. I had one in the 1980s. I've used it every day so far. Comfortable, practical and beautiful. I'm sure this car was on display at the NEC a couple of years ago. Ditto the admiring comments above. It looks like a lovely example and well looked after. A good one reminds you just how damned attractive they were! And useful to boot ...pun intended! All of the Australian import series 3 HPE`s (renamed HP Executive) and Coupes had the stainless steel window trim painted black to give them a more "contemporary and sporting 1980s look" but which was a visual negative and detracted from the lovely lines of the car in my opinion. Not to mention that the paint looked crappy when the Australian sun had taken its inevitable toll! To my knowledge, there were no fuel injected Betas officially imported into Australia because the importer was fearful that the new fangled fuel injection technology would give too many problems reliability wise and swamp them with warranty claims. So they deliberately requested only carburettored stock and hoovered up the remaining global RHD supply to be able to keep selling carbie version Betas until production ended. Which makes me wonder whether Lukas`s 82 HPE 2000i.e. is a UK sourced private import? Lukas's HPE is LHD. He bought it in his native Poland I believe? Thanks for the clarification Neil. I have read a few more posts of Lukas on different threads. He is a very knowledgeable, passionate and talented restorer of Betas! It seems I overlooked this thread. Anyway thanks Gromit for your appreciation. I imported my HPE from Germany to Poland where I rebuilt it and where it is sitting in a warm garage and waiting for me as I am currently living in Melbourne, Australia. That is surely a great car, also thanks to its fuel injected engine. It is a shame to be honest, that they were not exported overseas with that specification. Time proved that no doubt the injection system is one of the most reliable components in that car... and makes starting and maintaining the car so easy. 2000IE cars were exported overseas to USA even if not Australia. 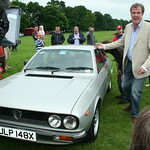 Sadly most were Zagato (Spider) models with some Coupes as well. Any other model was rare, and Scorpion (Montecarlo) only made it here until '77. Beautiful car. My HPE is same color and it really shows off the lines.